In 2002, it delivered Dontrelle Willis' Rookie Card, B.J. Upton's Rookie Card and Khalil Greene's Autographed Rookie Card. Last year, it was the autographed rookie cards of Rickie Weeks and Delmon Young that kept collectors coming back for more. And this year, Bowman Draft Picks & Prospects Baseball is even bigger and better! The 175-card base set includes 30 MLB rookies, 90 Draft Picks from the 2004 Amateur Draft, 45 Futures Game Prospects and 10 Autographed Rookie Cards (Chrome versions only). See full checklist below. 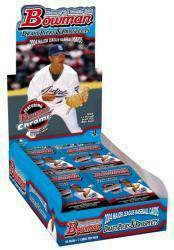 There are even 1 of 1 printing plates for both the Bowman and Bowman Chrome cards - 1360 in all! Memorabilia collectors will be pleased to know that there are 20 base card variations featuring a piece of Futures Game-used jersey and 20 different Prospect Premiums Relic cards. And the Signs of the Future Autograph program is back featuring 6 can't-miss prospects. EVERY BOX, FEATURING 2 BRANDS IN ONE, GUARNTEES 1 AUTOGRAPH AND 1 RELIC! Seven-card packs of 2004 Bowman Draft Picks & Prospects (shipping Nov. 22nd) carry a $3.00 SRP. Each pack features 4 Bowman cards, 2 Bowman Chrome cards and 1 Bowman Gold Parallel.